So much yarn, so little time. 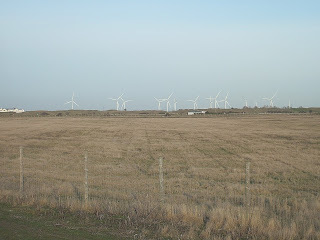 : Windfarms - for or against? 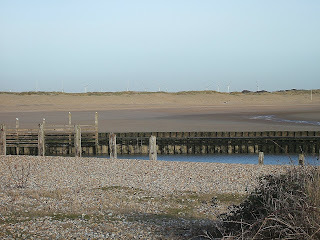 We went for a walk at Rye harbour yesterday, and of course passed new local landmark - the wind farm. I actually find them quite attractive, and this was the first time I'd seen them since they became operational. I'd expected them all to be turning together (a bit like synchronised swimming!) but in fact they each move independently, as if to a different drum. There was a huge outcry in the local paper when the windfarm was first suggested, and this continued throughout the construction. Obviously the traffic must have been a nightmare: these things are HUGE. Yet to claim they are a blot on the landscape seems wrong, in my opinion. this is not an unspoilt "natural" landscape by any means. Others feared for the birds (this is a nature reserve with many water birds) but surely they are big enough for even the daftest of birds to notice and avoid? I think the are beautifull and unavoidable. Surely with Dungeness so close by people realise that the alternative is far uglier? I would agree with you on liking wind turbines, I think they are attractive and not at all a blot on the landscape like some say. Sadly, they are not a practical solution for supplying all our energy, so the power stations are still a necessary evil.